Craig Lowndes described today’s front-row performance as a relief for the entire TeamVortex crew after a series of qualifying disasters for the Supercars veteran. Lowndes scored a second-best starting spot of second, less than 0.01s from pole, after struggling to 18th or worse in six of the previous seven qualifying sessions. A strong start on the grippy side of the track allowed Lowndes to lead the opening stages before an aggressive pit strategy saw him slide to an eventual fifth place finish. "There was a big cheer when I came back in. I think everyone was relieved," Lowndes told Supercars.com of qualifying second. “Everyone has pressure on each other to lift and perform and it was just a matter of time before we got back to the front. “For us it’s all about being comfortable in the car and getting the best out of it. We hadn’t been able to do that until this weekend. “We still haven’t (completely) unlocked the secret yet. 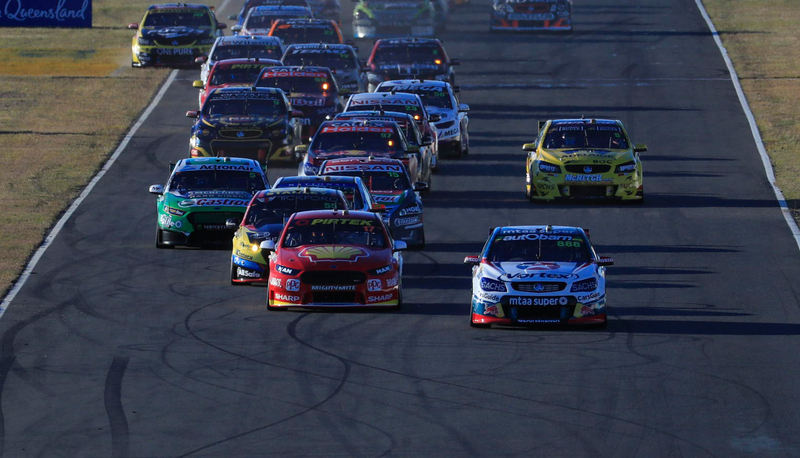 We’ve got to do it all again tomorrow and then we’ll move on at Sydney Motorsport Park. Lowndes admitted that pitting on lap four of 39 – one lap after losing the lead to McLaughlin – had been too aggressive. Unlike several races this year where McLaughlin’s crew has covered Triple Eight and pitted immediately afterwards, the Shell Ford waited another seven laps before taking four tyres. McLaughlin rejoined from his stop immediately behind Lowndes and once again overtook the Holden before going on to victory. Lowndes’ strategy was in stark contrast to that of Triple Eight stable-mate Shane van Gisbergen, who split the race into two equal stints and charged from eighth to third in the closing stages. “We were always going to have an aggressive strategy going into the race thinking that our tyre life would be good,” explained Lowndes. “We had a slow pitstop which meant we should have been two or three seconds further up the road than what we were. “When Scotty came up behind us with four fresh tyres we knew we were in trouble. “In hindsight it was (too aggressive on strategy). We only went by our race run yesterday where the tyre life was really good. “We thought with the sun going down in the late afternoon it would be better, which it was, but the pace of the race was higher than we expected.